University of Cape Coast, B.S. International Development; International Political Economy; Household Well Being; Sustainable Livelihoods; Sustainable Development; Development Studies; Development Management; Poverty Reduction; Climate Change Adaptation; Agriculture and Rural Development; Land Tenure; Environmentally Induced Vulnerabilities and Human Security; Resilience; Migration and Development; Youth Policy Analysis; Environment, Health and Human Well-being; Employment and Labour Policy; Project Management. Joseph Assan is currently an Assistant Professor of International Political Economy of Sustainable Development in the Heller School for Social Policy and Management, at Brandeis University. Joseph Assan holds a PhD from the University of Liverpool, UK. 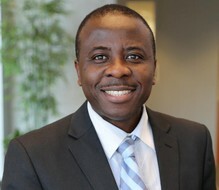 Until his recent appointment at Brandeis University, Joseph was an Assistant Professor of Development Practice at Trinity College Dublin where he acted as the associate director of the Masters in Development Practice Programme which was jointly run by Trinity College Dublin and University College Dublin, Ireland. Prior to this, Dr Joseph Assan served as the Director of the International Development Programme at the University of Liverpool. He previously worked as lecturer in Development Studies at the University of East London, UK. Joseph has extensive field research experience in international development policy and practice and has worked as a project officer with organisations such as the Global Hunger Project New York. He has published in numerous international peer reviewed journals including Area Development and Policy, Foreign Affairs, Journal of Sustainable Development, Journal of International Development, and International Development Planning Review. He has recently carried out research on the interaction between sustainable livelihoods, environmental variability/climate change and household well-being within the context of poverty reduction. Over the years, Joseph has developed teaching skills and research expertise in the field of political economy of international development with an interest in the interaction between development theory, policy and practice in Africa and Asia. Dr. Joseph Assan was recently invited to speak on Capitol Hill, discussing how to sustain Africa’s current growth and reduce inequality. He has also participated in various international high level fora including recent meetings at Brookings Institution, Washington DC, focusing on USA, China and Africa relations, Employment development strategies in developing countries, Internal Displacement and Vulnerability among others. Joseph served as a member of the scientific council of the Development Studies Association of UK and Ireland for several years. He currently serves as a board member of Boston Network for International Development (BNID).